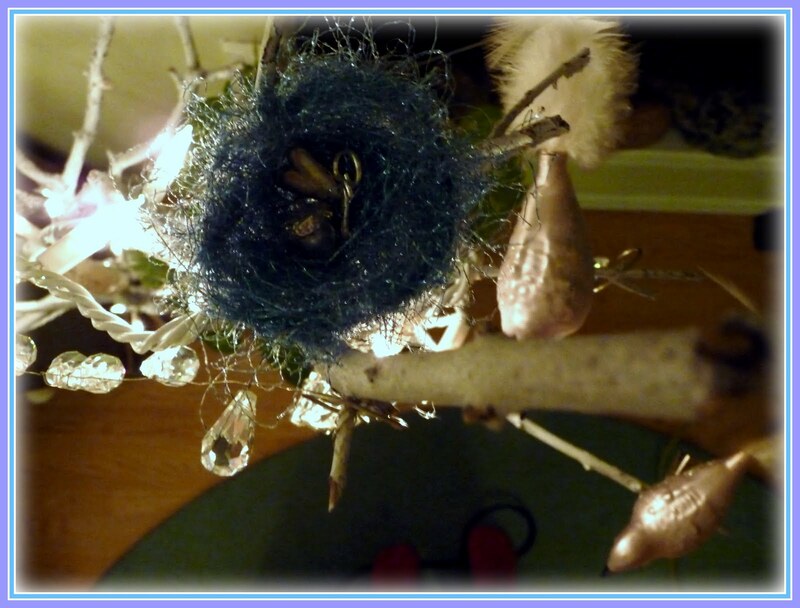 The Faeries have built a nest in my house tree recently, a very sparkly blue nest! 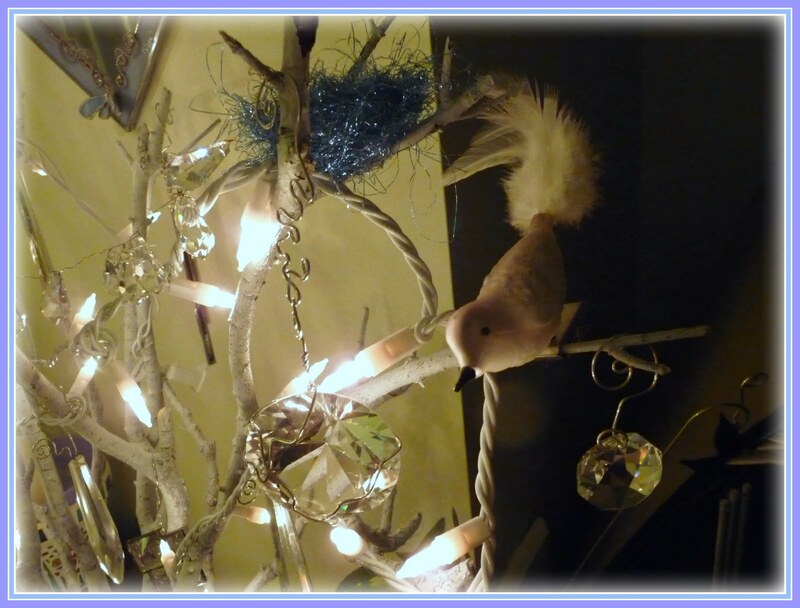 At first it was just a little wispy snaggle of sparkle clinging to one of the upper most branches. It stayed like that for the longest time...weeks. I can't even remember how long ago I noticed it and thought, that's pretty, how did that get there? And I just kind of left it there, didn't really pay it too much attention. Then, it became something, and that something was a nest that was settled into a perfect little crook in the branch. How do I know it was the faeries, you may ask, and not the pink curly birds? Well, I peeked inside and saw there was a stash of faerie treasures and trinkets! They're very speedy, I haven't caught sight of them yet, but I've got an eye out. I think they were attracted by the sparkles from my icicle collection. 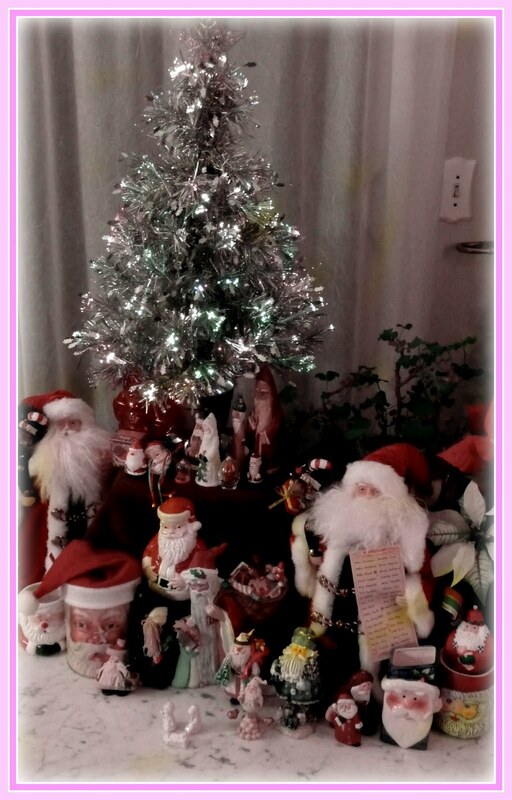 My Santas are all set up, I pushed the coffee table over in front of the window, they make a cheery display. I love looking at them and remembering where each one came from. I set the whole thing up while my Mum was out of the room and she was so tickled when she came in and saw them. But later that afternoon, she completely took credit, not only for setting them up, but she also took complete ownership of all the Santas! I said, I bet you remember where each and everyone of those came from...No..she says, I can't remember. She's silly, she keeps me on my toes! Other exciting news on the fiber front, forever and ever ago I pre-ordered this new art yarn spinning book by Jacey Boggs and yesterday it arrived!!! I've peeked through it and I'm looking forward to digging into some different techniques. It looks really good and it includes an instructional DVD as well! The bonus is that it's signed too, super cool right! 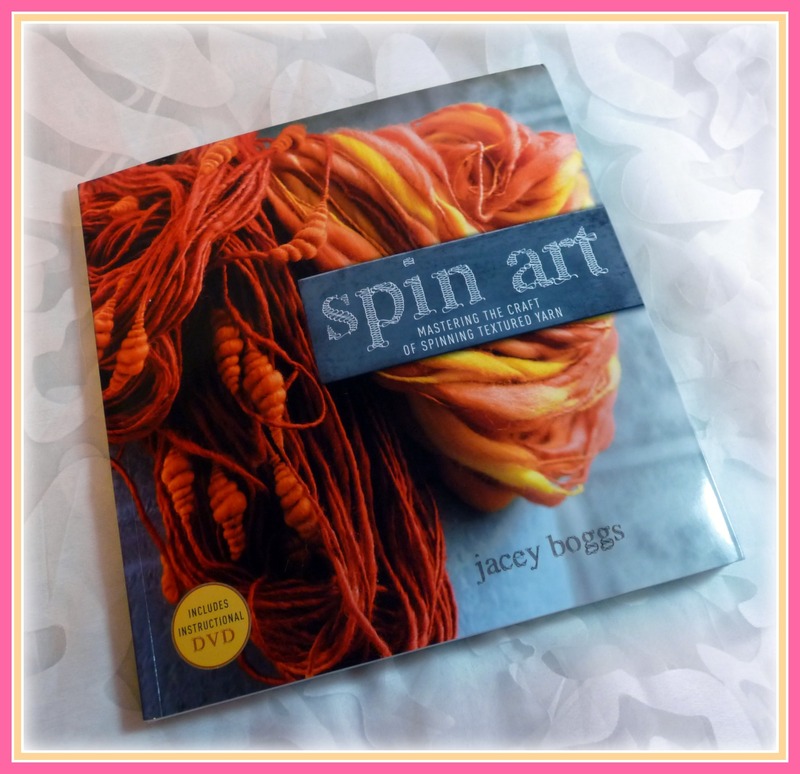 You'll definitely want to add this to your art yarn spinning reference library. I hope you are all having a warm and loving holiday season! SQEAL! That means my Spin Art book should be coming any day now. Hooray! Ah, I love that the fairies visit your place. I think I saw the trinkets in the photo too. Your Santa display is beautiful. Tell your mother hello from me. Love the tree and nestlings too. Everything is soooo pretty and thank Mum for sharing it with us. 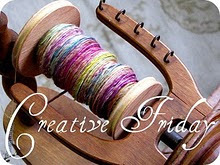 Look forward to seeing new yarns by you. Happy spinning and reading. So pretty :) Lovely fairy nest! A faerie nest in your Christmas tree?!? How exciting! Your one lucky girl to have received such a lovely faerie nest!....your house look very festive. I'll have to check out that new spinning book. What a festive display you have! I love it! 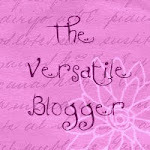 Look at those lovely coils on the spinning book cover - woot! I am certain you will thoroughly enjoy that book. And I agree with Melissa - your house is all decked out and festive. I'll have to add that book to my wish list!